to RAF Cardington for selection for the 1962 winter entry. 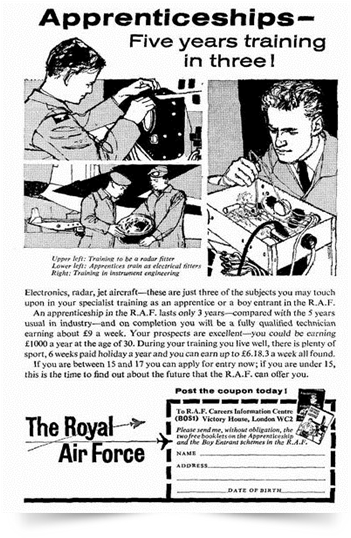 as an RAF Apprentice from Bushey. all was to change over the next couple of days! Chief Controller and Top Twenty DJ; I also had my own B-Side programme I called "Over Under Sideways Down"
water skiing or snorkeling; hard life wasn't it! wouldn't shift on the turntable! were in-service with the Royal Air Force, 1964 - 1990 including RAF Bloodhound Squadrons and Support Units. supporting the introduction of Skyflash into service.